Rattenberg, on the River Inn, is the smallest city in Tirol. It is a serious glass-making center whose motto is "glass is the fortune and pride of the earth". A walk down the main street, Sudtirolerstrasse, brings this to life with shop after shop displaying high quality crystal and glass products and antiques. It is worth a trip here just to visit Kristallglas Kisslinger. 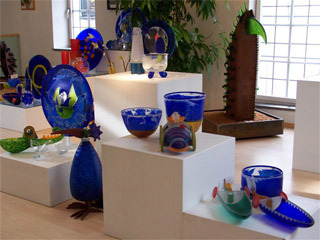 Thousands of visitors come to watch the glass blowers, glasscutters, glass painters and engravers do their creative work. They have been perfecting the art for generations and have kept pace with the times uniting modern design with glass-making tradition. The shops display not only a huge selection of their wonderful creations but works of other famous producers. The striking architecture is enhanced by liberal use of marble that is natural to the area. Adding a colorful dimension, street level windows sills of most shops are marble shelves, which traditionally were used for displaying their wares. High on Pfarrgasse is the elaborate Gothic Parish Church, which for so small a town is very large. The original, built for the residents of the town, was later enlarged with a second alter for the copper and silver miners who were responsible for the wealth of the town. The "Ruin of Rattenberg" sits high on a hill above the town. There is an open air stage and wood bench seating where performances are staged in the summer months with the remains of the castle as a backdrop. At the foot of the castle, built right into the mountain, are the picturesque Nagelschmied (nail smith) houses. The distinctive masonry of the facades and marble window frames and portals are believed to have originated in the 12th century. Nowadays they house the Arts and Crafts Museum where ancient furnishings, handicrafts and art are on display. We took a coffee and pastry break at the Golden Coffee Bean Award-winning Cafe Konditorei Hacker at Sudtirolerstrasse 46. This 15th century gingerbread house is known far and wide for its cakes and pastries. The apple strudel we shared was among the best and the coffee was superb. We saw the chef preparing a delicious-looking pasta dish in the open kitchen. It's a convivial place which encourages lingering and all the inside and outside seats were occupied. Luckily we found a spot at the attractive coffee bar. When you go to Tirol, include Rattenberg in your itinerary  good things come in small packages! Our next Tirol gem was Hall, on the doorstep of Innsbruck. We stayed the evening at the Park Hotel, Thurnfeldgasse 1. This ultra modern building is round in design and all glass. When we entered our 7th floor room, the drapes were open and it was like being outdoors. Each room has its own laptop computer with free internet access, a first for us and very welcome! The modern decor and furnishings are consistent with the exterior expression. The hotel is just outside the ancient town walls and stands in complete contrast to the medieval facades in Hall town center. The Gasthaus Aniser, Schlossergasse 15, was a perfect place to meet the locals and have some large portions of good home cooking. Start with beer, let tradition roll with a hearty liver dumpling soup, roast meat smothered in onions and a kinder (child-size) portion of schnitzel (still huge). All was accompanied by potatoes and knudel. We enjoyed conversing with a wonderful, warm couple who joined us at our table and then took us on an evening tour of the town. Thanks to our new friends, this was one of the most delightful evenings of our trip. The marvelous architecture looked very dramatic in the glow of the street lights. Many of the main buildings had special lighting that deepened the impact. The next morning, with the sunlight highlighting the warm colors and textures, the beauty of Hall revealed itself again. We have found Austria to be extremely caring about the maintenance and upkeep of its buildings and the cleanliness of all public and private facilities (including the public WCs). The streets and buildings of old Hall followed this tradition. Folks were sweeping and washing as we strolled through the picturesque streets, passageways and courtyards. Hall has always been a fairly prosperous town. Hall means salt, which is called white gold. The old salt mines nearby were the source of the wealth. The Stiftsplatz has a striking architectural heritage formed by the Sacred Heart Monastery, Noble Women's Convent and the Jesuit Church. The convent was founded in 1569 for wealthy women. Between 1611 and 1691 it was given a grand stucco finish. It was closed in 1783 and since 1912 has been in use as a monastery. The Jesuit College was founded in 1571 to meet the intellectual needs of the convent. The monastery was fully renovated between 1671 and 1684. In the late 17th century it received a Baroque makeover. It was closed in 1773. The regional court is now housed in the complex which includes a fine Baroque inner courtyard. After Hall was given town status, a castle was built to protect the salt works, the river traffic, the bridge and the old salt road. 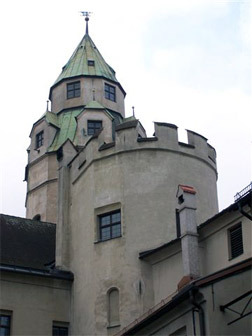 The Hasegg Castle is home of the Hall Mint, and the legendary Mint Tower which is considered to be one of the most prominent achievements of late medieval architecture. Its ingenious geometrical structure amazes the experts. With a twelve- cornered superstructure it is the unmistakable landmark and symbol of the city of Hall. Best of all, we were able to wind our way up the inside spiral staircase and be rewarded with views of the old town, Inn valley and Karwendel mountain range. The first international currency in the world, the Hall "Taler" was minted here! The mint was closed in 1809 and coins not minted here until 1976 for the Innsbruck Winter Olympics. At that time, the castle was made accessible to visitors. The fascinating coin museum provides an overview of the history of coins and some impressive exhibits of minting machinery and how it changed overtime. At the end of the tour we were invited to make our own coins, which are lovely souvenirs. The Rathaus (Town Hall) was rebuilt after the great fire of 1447. Colorful coats of arms and attractive sculptures dominate the facade along with a balcony that was for the town crier, who read the daily news to those gathered below. The council chamber, a popular venue for weddings with its magnificent beams from 1451, is still used for town council meetings. Nearby is the St. Nikolaus Parish Church which was initially consecrated in 128l has been enlarged three times. Because this could be done only by going north, the alter is curiously off center. The original Gothic tower, which collapsed in the earthquake of 1670, was replaced by a Baroque onion dome. The Knight Florian Waldauf who was a dear friend of the Emperor of Austria was allowed to indulge his passion for collecting bones. The Waldauf chapel in the front left section houses his bone collection. Florian and his wife are buried under the alter. The St. Magdalena Chapel curves around in front of the Parish Church. The double chapel has shops on the ground floor and the upper frescoed section is used as war memorial chapel. Next door is the smallest Parish Church which is an architectural delight. Two arched wooden doors open to reveal a beautiful alter that was brought from a cloister in the mountains where miners prayed. Huge wall paintings depict good and evil. The Salt Mining Museum in the heart of town is a miniature mine where visitors descend to view the galleries, shafts, and drilling machinery. The museum brings to life the atmosphere inside the Hall Valley's abandoned salt mines. The town is a shoppers paradise. Well kept shops with the symbolic wrought iron signs line the winding streets while outdoor shopping and snacking can be enjoyed at the upper market and the lower market plus at the Farmers market on Saturday mornings. 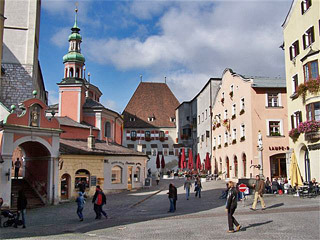 Craftsmen from around Austria come to show and sell at the famous pottery market held twice a year. The huge Christmas Market attracts throngs from around the region and beyond. If youre into biological (organic) products the shop Gutz aus der Natur, Eugenstrasse 12, has a mouthwatering assortment of local spirits, sausages, cheese, oils, vinegar, jams, honeys, juices and wines. All the products are well presented and visitors are welcome to browse. The entire region of Hall, is a place of natural beauty for sport or pure relaxation. There are year-round festivities built around music, dance and culture. Nearby Hall is Wattens home to the amazing Swarovski Crystal Worlds. We decided to move on to Innsbruck and after lunch take the shuttle bus across from the Innsbruck train station for our visit to Swarovski Crystal Worlds.